Use stunning live wallpapers on your desktop. Create your own custom wallpapers and share them on Steam Workshop! -Bring your desktop alive with real-time graphics, videos, applications or websites. Personalize your wallpapers with your favorite colors. -Use interactive wallpapers that can be controlled with your mouse. -Support for many aspect ratios and native resolutions including 16:9, 21:9, 16:10, 4:3. -Support for multi monitor environments. -Wallpapers will pause while playing games. -Create your own wallpapers with the Wallpaper Editor. Use the Steam Workshop to share your wallpapers. 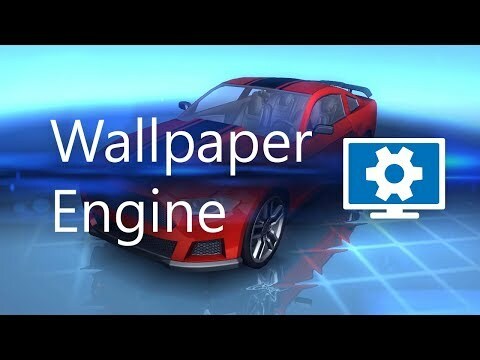 -Wallpaper Engine can be used in parallel to any other Steam game or application. Wallpaper Engine was added by magdygamal in Feb 2017 and the latest update was made in Apr 2019. The list of alternatives was updated Apr 2019 There is a history of all activites on Wallpaper Engine in our Activity Log. It's possible to update the information on Wallpaper Engine or report it as discontinued, duplicated or spam. Set a website, social network, movie or other content as your Mac desktop background with Desktopr. VDesktop is a program that allows users to have animated wallpaper on their Windows desktop. VDesktop supports Windows 7, 8, 10. Plugin version of ZGameEditor engine built for audio visualization and bundled in FLStudio. Alternatives to Wallpaper Engine for Windows, Mac, Linux, FL Studio, Winamp and more. Filter by license to discover only free or Open Source alternatives. This list contains a total of 21 apps similar to Wallpaper Engine.